This article summarizes various rumors about secret U.S. air vehicles, which were possibly tested at the Groom Lake facility (a.k.a. "Area 51", and possibly officially known as "Watertown"). The data has been provided by sources, who claim to have inside information on Groom operations and have allegedly decided to lift the lid of secrecy a bit. However, the reader should always keep in mind, that the information is unverified and quite possibly distorted or plain wrong! To make this clear, every section is divided into two parts: Rumors, where the various claims are presented essentially "as is", and Comments, where I try to evaluate the plausibility of the claims. In this context, it must be noted that the major source for many projects on this page (Sentinel, Astra, Bright Star, COPPER COAST) made a brief statement in the past about the "Bird of Prey" program, calling it a "modified F-15". This has been proven wrong by the revelation of the Boeing "Bird of Prey" stealth technology testbed. This mistake (or deliberate disinformation?) casts further doubt on the other claims by this source. For information about programs, for which more substantial evidence exists, see the excellent article "Black Projects at Groom Lake: Into the 21st Century" by Peter W. Merlin. This aircraft was built by General Dynamics (Fort Worth), now part of Lockheed Martin, and first flew in 1986. It is a single-seat Mach 3+ reconnaissance aircraft for NRO, and significantly more stealthy than the SR-71A. It is of almost perfect delta planform with 65° leading edge sweep, and its ventral air intake is highly blended into the fuselage. As of 2001, four of these aircraft were operationally based at Groom in hangars 20 through 23. The unofficial F-121 designator was allocated after Lockheed Martin took over the GD Fort Worth assets, and the 121 is said to honor the Lockheed article number of the first A-12 Blackbird aircraft. The F prefix is widely used for bogus designations of secret aircraft, and is not meant to designate the Sentinel as a "Fighter". The code name "Centennial" was also mentioned for this aircraft. 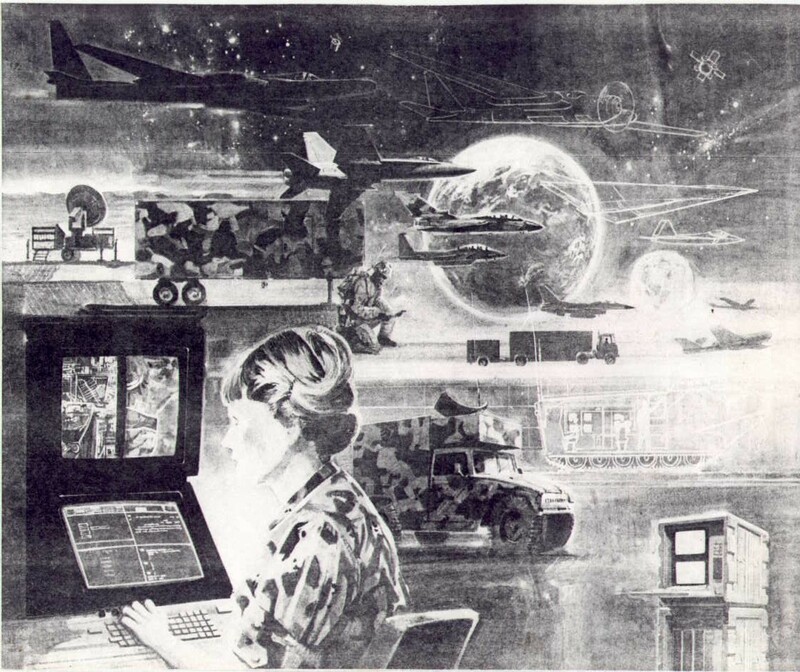 The above image is part of a Hughes Electronics artwork showing various systems for which Hughes provided electronic and/or reconnaissance equipment. 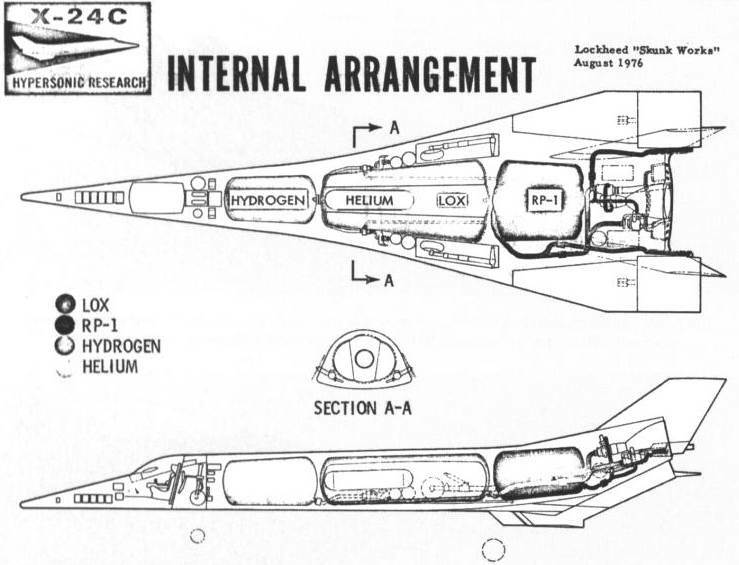 The large outlined delta shape is the F-121. The aircraft has been sighted on several occasions. The most widely publicized events were a sighting by Chris Gibson over the North Sea in 1989, and by Meinrad Eberle (a.k.a. Swiss Montain Bat) et.al. on 8 September 1999 from Tikaboo Peak. 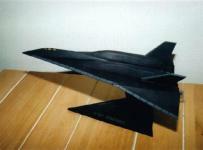 Below are pictures of a model of the F-121, which was built by Byron Salisbury based on sighting reports. 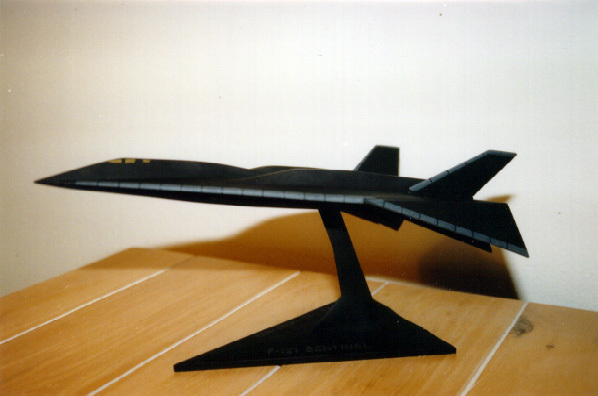 The model has a fair number of inaccuracies (e.g., the F-121 has no overwing engine housings and ventral fins), but illustrates the basic design relatively well. If the Hughes graphic is genuine, this aircraft was at least on the drawing boards. If it was actually built, it is definitely an excellent candidate to explain sightings of "large triangular" unknown aircraft. However, there are many major problems with the story: the timeline, a whole group of operational aircraft at Groom Lake, and last but not least the statement that the F-121 was "for NRO" - the National Reconnaissance Office operates spy satellites, but no aircraft! The alleged names and designations also look rather suspicious. The "F-121" label and its background is highly dubious, and the reported names "Centennial" and "Sentinel" sound rather similar - one of them is probably just a garbled variant of the other one. Although it is quite possible that one (or more) large delta-winged aircraft were/are flying in secret (because of various unconfirmed sightings), any actual names and configurations are still completely unknown (see also Snow Bird). All said, I think it's highly unlikely that the rumored story of the "F-121" comes anywhere near the truth. The A-11 Astra is a stealthy replacement for the F-111 Aardvark. It is described as a long highly-swept delta with a serrated trailing edge. Forward-swept rudders are mounted on articulated pylons extending from the trailing edge, and flush ventral air intakes are located near the leading edge. 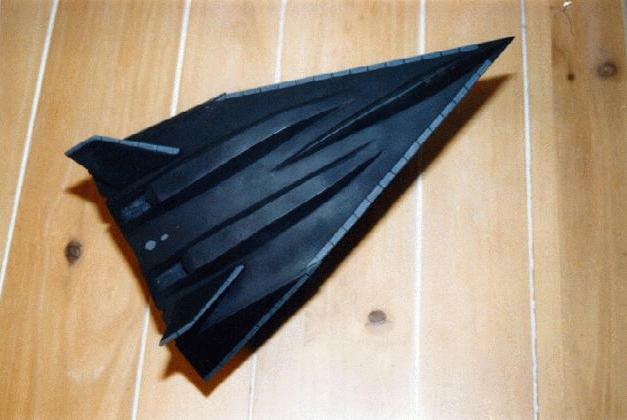 The design is less faceted than the F-117. Characteristics are similar to those quoted for the ATA-B proposal of 1978. The Astra was still in production in 2001, and three aircraft were at Groom at that time for continued developmental testing. There are some indications, including sighting reports, that an aircraft with the claimed characteristics could actually exist. However, it is also said that the aircraft looks very similar to an F-117A (from some angles, at least) except for its size. Because it is almost impossible to estimate the dimensions of an aircraft in the sky without a known reference, any sighting might easily have been just a mis-identification of an F-117A. Also, the claims that (a) the "A-11" is essentially using 1980s stealth technology, (b) was still in production in 2001, and (c) has not been made public, simply don't add up. Finally, the "A-11" designation (filling the gap between the A-10 Thunderbolt II and the cancelled A-12 Avenger II) and "Astra" name are very dubious. In the past, the USAF has never allocated a standard aircraft designator to a classified aircraft (for obvious reasons), and the "Astra" label has been associated by Black Projects researchers and the "UFO community" to all sorts of claims, including rather outlandish ones. The "A-11 Astra" rumors are probably a medley of various more or less unfounded claims, which someone has unsuccessfully tried to connect into a coherent story. The Bright Star is a private venture of Lockheed Martin Skunk Works. It is a Mach 2+ supersonic cruise/sonic boom research aircraft, which was used by the Skunk Works to raise DARPA's interest in QSP (Quiet Supersonic Platform) research. Although it is not a DOD project, the USAF provides some support (at least by providing a secret flight test location). The Bright Star has been flying for many years, and was the cause of some of the unexplained sonic booms over the western USA. The Bright Star is the most plausible cause for many so-called "Aurora" sightings. Bright Star is said to be the cause for the famous "Donuts-On-A-Rope" contrails (for photos, see this page), often reported together with a "rumbling" sound. The rumbling is generated by the vehicle in the transoinc speed region, and is essentially a series of low-amplitude sonic booms at a frequency of 1 to 3 Hz. The "donut" contrail is formed by water vapor captured in the shock wave. 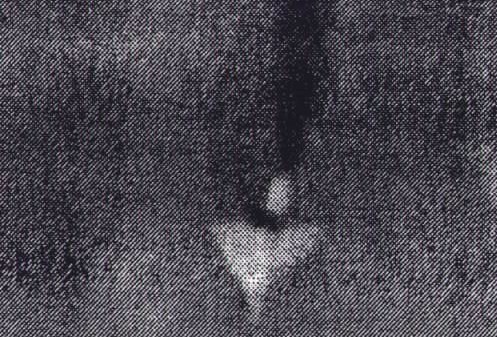 The "pulsating" sonic boom is directly responsible for both the characteristic sound of the aircraft, and the "strange-looking" contrails. The photo of unknown origin is inconclusive at best, and might just as well show another delta-winged aircraft (e.g. a QF-106 drone). The "Donuts-On-A-Rope" contrails are highly controversial, and it is far from certain that they have been produced by an undisclosed type of propulsion system. However, the von Retyi photo does indeed show a large white aircraft. So even if the background story and name of Bright Star is all made up (which it may or may not be), we have at least one genuine unidentified aircraft. The HGV was a recoverable unmanned rocket-powered hypersonic vehicle, contracted in 1979/80 to the UAB (Unmanned Aircraft Bureau) of the Lockheed Skunk Works. It could achieve a speed of Mach 18 and a range of 8000 km (5000 miles) when launched from 20000 m (68000 ft) by a highly modified B-52H. At one time it was planned to develop the HGV into a survivable quick reaction nuclear strike weapon with a payload of two or three nuclear warheads. Some sightings of HGV flight tests were reported during 1989/90. The HGV was about 9 m (30 ft) long, had 75° delta wings, and four vertical tails. 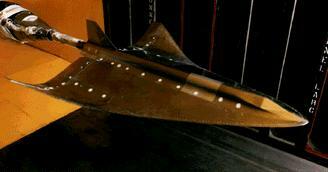 It also featured an extendable aero-spike (similar to the Trident SLBM) to reduce hypersonic drag. It is certain, that the HGV existed as a project, but actual flights were never officially announced. For additional information on the HGV program, including an unofficial image, see this page. Snow Bird is a very high-speed (Mach 3.5+ cruise) reconnaissance aircraft, which was developed out of the so-called BRILLIANT BUZZARD as a replacement for the SR-71. The name apparently refers to its color (white thermal protection tiles). BRILLIANT BUZZARD (possibly not the real code name) resembled a flying wedge with twin vertical stabilizers. Snow Bird is somewhat similar, but is possibly slightly more rounded externally. It's delta wing planform is roughly similar to that of the Concorde, and it has ventral intakes and inward-canted twin vertical tails. It was flying in late 1999. This is yet another claim about fast delta-winged aircraft (see also Sentinel). Although it is quite possible that one (or more) large delta-winged aircraft were/are flying in secret (because of various unconfirmed sightings), any actual names and configurations are still completely unknown. The Snow Bird story appears to be just another variation of the "secret SR-71 replacement" theme, although in this case no claims are made about actual operational aircraft (which is more realistic, therefore slightly adding to the otherwise marginal credibility of the rumors). 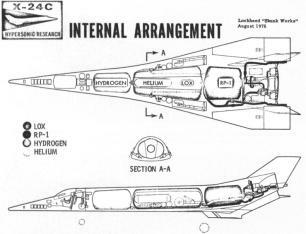 In the mid-1970s, NASA studied hypersonic vehicles as follow-on projects to the X-24B lifting body under the general "X-24C" designation. Lockheed Skunk Works' concept for the X-24C was the L301 design. The L301 was to be rocket and/or scramjet powered, and was designed for speeds of up to Mach 6.65 at 28000 m (92000 ft) altitude. 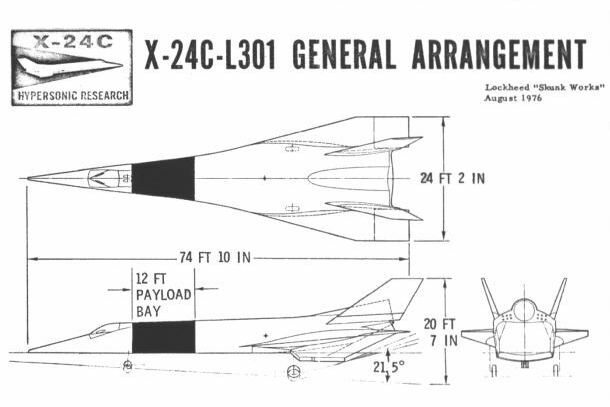 In September 1977, the X-24C/L301 project was officially cancelled for lack of funding, thus ending the documented history of the L301 in the "white world". After official cancellation, the DOD took over the L301, and development was continued under the highly classified project COPPER COAST. 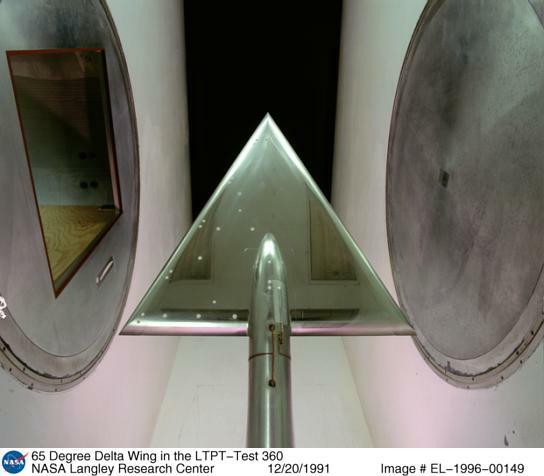 Lockheed also studied operational derivatives of the L301 as potential successors to the SR-71. These studies included designs for Mach 4 at 60 km (200,000 ft) and Mach 7 at 75 km (250,000 feet). An L301/COPPER COAST test vehicle, slightly different from the published configuration shown in the drawings, was actually built, and it first flew in 1981. The planned operational derivatives of the COPPER COAST vehicle were cancelled, however, because the contract for the SR-71 successor went to General Dynamics with their Sentinel design (see F-121). The L301/COPPER COAST flight test program was run by NASA-Dryden, and in the later flight test phase the NASA referred to the vehicle as SYNCON (Synergetic Configuration). NASA also planned waverider designs as follow-on projects to the L301. The photo below is said to show a wind tunnel model of such a design. There are no hints whatsoever in open references, that the X-24C/L301 project was continued in any way after its official cancellation. And the notion that NASA runs a flight test program so secret, that even its existence is classified, also doesn't sound very plausible. Therefore the credibility of the L301/COPPER COAST rumors is close to zero.